This is one of the relatively few perennial streams/rivers in the Mojave Desert. Only 32 miles long, fed from warm spring waters it curves around the Valley of Fire in Nevada and empties into the Overton Arm of Lake Mead. From about 1855 when Mormon pioneers came into and settled the area, they called it the Muddy River. Officially it was known as the Moapa, which Moa, meaning "muddy", and pah, meaning "water", would be better translated as "muddy water" instead of river. The locals never took to calling it the Indian name and persisted in calling it the Muddy River. In 1960, tired of seeing maps they felt were incorrectly labeled, the government gave in and officially renamed it the "Muddy River." The Muddy River Springs area and the Muddy River are bounded by the Meadow Valley Mountains to the north, the Morman Mountains to the northeast, the Muddy Mountains to the south, and Arrow Canyon Range to the west. The Muddy River originates from a system of spring tributaries, which are clustered along the northeast slope of Arrow Canyon Range. These tributaries generally consist of warm-water springs and seeps that emanate from alluvial deposits, occuring near surface exposures of carbonate rocks. These springs and seeps discharge into the mainstem of the Muddy River through three spring tributaries that include South Fork Muddy River, Muddy Springs Tributary, and Refuge Stream. Streams in the Muddy River Springs area typically are meandering, shallow channels consisting mainly of mud and organic debris. Most banks are thickly overgrown by Saltcedar (Tamarix ramosissima), cattails (Typha latifolia), and reeds (Phragmites communis). Many irrigation diversions and ditches previously existed in the Muddy River Springs area. Most of the ditches have been abandoned with the exception of channels near Cardy Lamb Springs and Unnamed Springs near LDS East Well. 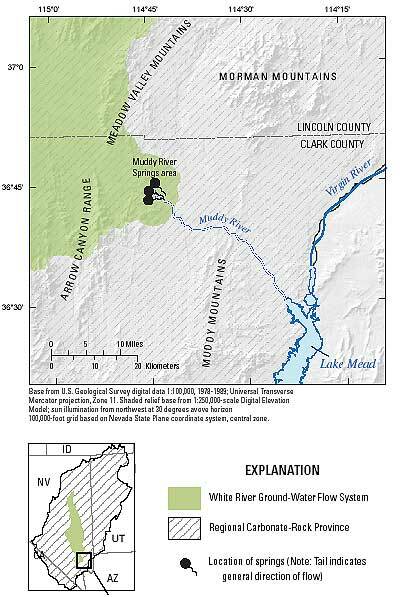 The Muddy River flows through four farming communities (Moapa, Glendale, Logandale, and Overton) and through the northeast corner of the Moapa River Indian Reservation draining about 6,940 mi² into the Overton Arm of Lake Mead, west of the mouth of the Virgin River. Diversions from the Muddy River primarily are used to irrigate nearby farm land and to supply water for the Reid Gardner Power Generating Station and Moapa Valley Dairy. The Muddy River is incised moderately (about 20 ft deep), with the channel consisting of mud, sand, gravel, and organic debris. Most banks of the river are overgrown thickly with Saltcedar and other vegetation. California Wash and Meadow Valley Wash systems contribute surface water to the Muddy River during periods of heavy rainfall. These two systems enter the Muddy River near the towns of Moapa and Glendale, respectively.